These Classic Apple Fritters Doughnuts are just like the ones from your favourite bakery or donut shop. Make them at home to enjoy anytime (and they freeze beautifully!). If there is a better treat to enjoy with my Sunday morning coffee, I don’t know what it is. Homemade Apple Fritters have been on my baking bucket-list for some time and a rainy Saturday afternoon presented the perfect opportunity to tackle them. The recipe comes from “Top Pot Hand Forged Doughnuts” – a doughnut shop from Seattle. I had picked up their cookbook a while back and just knew they’d offer up a recipe that wouldn’t disappoint. (I have adapted/simplified the process a bit here though, as I found the original un-necessarily complicated). Let me just say first off – these are the real deal. 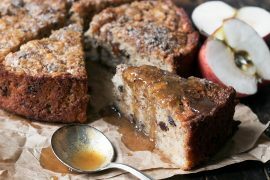 They are made with a great yeast-raised dough, which is chopped together with cooked apple chunks and perfectly speckled with cinnamon. Once they are cooked up, they are lovely and browned on the outside and light and fluffy on the inside. The glaze adds a thin layer of sweetness and makes these beautiful donuts sparkle. I don’t do a lot of deep frying, but in my world, it just isn’t really a donut if it isn’t fried, so it has to be (with all due respect to anyone who bakes donuts out there :). That said, if you’re careful to keep your oil at the right temperature, you’ll find that these donuts will absorb very little oil and won’t be at all greasy. I really recommend a deep fryer, for best results. I have a small one, which I love, because it doesn’t take gallons of oil to fill it. It also keeps the oil at the perfect temperature throughout the frying process, so there’s no fiddling around. One less thing to worry about. Alternately, you can use a heavy, deep pot with a thermometer to monitor oil temperature. Cook your fritters until they are a darkish golden colour. They’ll look lovely and you’ll ensure that the dough is well cooked, as well. These are best on the day they are cooked, but they freeze beautifully, so don’t hesitate to pop any extras into the freezer to enjoy later. These are best on the day they are made, but they freeze beautifully if you can't use them all up right away. A deep fryer is recommended or alternately, at least a thermometer so you can monitor oil temperature to ensure good results. For the dough: In a large bowl or the bowl of a stand mixer fitted with the paddle attachment, add the yeast to the 1/2 warm water. Add the 2 tsp. of sugar, stir and let stand 5 minutes. Meanwhile, in a large bowl, whisk together the flour, 1/4 cup sugar, baking powder, mace and salt. Set aside. When yeast is ready, add the shortening, egg and vanilla and mix with the paddle attachment on low speed for 1 minute (to break up the shortening). Add about 1/3 of the flour mixture and mix until combined. Add a second third of the flour mixture and again, mix until combined. Switch to the dough hook and add the remaining flour mixture. Knead with the hook until all that flour is incorporated. Now start adding flour in 1 Tbsp. increments, until the dough comes together, clears the bottom of the bowl and is becoming smooth. Knead on medium for about 2 minutes more. The dough should be smooth and but still a bit moist (but not sticky). Place the dough in an oiled bowl, cover with plastic wrap and set-aside to rise until doubled in size (about 1 hour). Meanwhile, make the apple filling. Place the diced apples, sugar and lemon juice into a skillet over medium heat. Cook, stirring often, until all the liquid has evaporated and the apples are softened, about 5 minutes. Remove to a bowl to cool completely before using. When bread has finished it's first rise, remove to a lightly floured surface and roll into a 10-inch x 10-inch square. Sprinkle the apples over one half of the dough. Sprinkle the 1 Tbsp. cinnamon evenly over the apples and then sprinkle with the 1 Tbsp. flour. Fold the empty side of the dough over the side with the apples. Using a sharp knife or a bench scraper, cut the dough into 1/2-inch wide strips from top to bottom. Repeat cutting 1/2-inch strips from side to side, so you end up with small chunks of dough. Gather up the dough bits and cut some more, from different directions, until it is in small chunks and evenly mixed with cinnamon/apples/dough etc. Using floured hands, roughly shape into a 12-inch long x 3-inch wide log. Cut the log into 1 inch slices. With each slice, roughly pat into a disc, about the size of your palm (use some additional flour, as needed, if your dough is sticky). Place the dough discs onto a parchment lined or floured baking sheet, leaving a couple of inches of room around each. Repeat with all 12 dough pieces. Cover with plastic wrap that has been sprayed on the under-side with baking spray and set-aside to rise until doubled again, about 30-45 minutes. Meanwhile, prepare the glaze. Add the icing sugar, corn syrup, salt and vanilla in a large bowl. Set aside. In a small saucepan, bring the water and white granulated sugar to a boil over high heat then reduce heat to medium and simmer for 1 minute. Add this mixture to the bowl with the icing sugar and whisk until all the sugar and has been incorporated and the mixture is smooth. Set aside. When dough is about ready to cook, heat oil in a deep fryer to 370° (alternately, use a heavy deep pot and a thermometer to monitor temperature). Fry each donut until deep golden on the underside (1 1/2 - 2 minutes), flip over and fry the other side. (*time and temperature may need to vary. Watch closely the first few to determine timing. If they seem to be browning too quickly, lower temperature slightly). Remove to a cooling rack placed over a baking sheet. While still quite warm, dip into prepared glaze and return to cooling rack to cool completely. Can frozen, store bought bread dough be used in place of the from scratch dough? Hi Judy, you could certainly give it a go. I don’t think frozen dough would have as much flavour as it would be lacking the egg/vanilla etc., so the finished product wouldn’t be quite a “fritter-y”. I was wondering if this could be doubled? And if so, is there anything you would adjust or just double each amount? Hi Amy and yes, you can just double everything and make a double batch of these! Do you peel the apples or leave the skin on? It’s been years since I made fritters of any sort. I used to work in a bakery and we always left the peel on. That of course was with an industrial fryer so the peels softened and then crisped up nicely. It would be really helpful if you could add this information to your ingredient list. Hi Lalise, You can honestly go either way. I prefer to peel them, but if you don’t mind peel, you can certainly leave it on without affecting the outcome. I have been trying to find a recipe for cherry fritters to no avail. After reading your recipe for these apple fritters, I plan to try to adapt this to use cherries in place of the apples, omit the cinnamon from the filling, and using the cherry juice/syrup from the cherry jar in place of the light corn syrup in the glaze. I am wondering if I should delete the lemon juice from the filling also. Is that added in your recipe simply for additional flavoring or does it serve another purpose? Also, do you think my adaptation of the recipe sounds like it will work out okay? Wow. 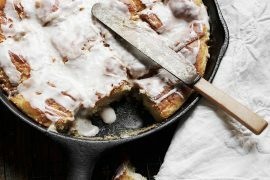 I bookmarked this page and your website, and printed your recipe, but could use a little help with deep frying. I’ll buy one of your recommended small deep fryers from Amazon, but am unclear as to what size I need… For example, do you fry multiple fritters at once, or just one at a time? I’ll try canola oil per your suggestion. Is it possible (adviseable) to reuse the oil, or must it be disposed of after just one use? Thanks for the GREAT article, the recipe and helpful discussion with your readers. Hi Tom, I opted for the smaller size so it stores more easily and doesn’t take a ton of oil with each use. But yes, that does come with a trade off, in that you can’t fry as many things at one time. When it comes to these fritters, you may only be able to fry one at a time. Maybe two. They need enough room to float flat on the top, so will depend on exactly how large your fryer is. Hello! What kind of oil do you recommend for frying? How would you go about freezing these? I need to make 2 batches for Thanksgiving dinner tomorrow but I have more time today to prepare it all. Any recommendations? These things are so good, they should be illegal. My 93 yr. old mother loves a good apple fritter and doesn’t treat herself to one very often. I thought I’d make your recipe. I bake with yeast quite often, but after reading your directions over and over, I am slightly confused. So I cut the dough vertically and horizontally until I get small chunks. Then I cut up the chunks a bit? Then, and this is where I’m confused, I pull them together to form a log 3″ by 12″. Am I correct? How do all those chunks stay together without falling apart in the frying? Please advise. I know I sound totally inept, but really I am an experienced baker. Thanks for your help. I just finished making these and well I am already on my second one. What yumminess! Better than any coffee shop apple fritter I have ever tried. It was my first time making a donut and read through a couple of recipes before deciding on this one. I am so glad that I did, so easy to understand and follow and the end results are so good! Corn syrup is not usually an ingredient that I have on hand so I just did a basic glaze of milk, icing sugar and vanilla worked out really well. Will definitely be making these again. No more coffee shop fritters for me. Thank you so much! Made these with a cooked glaze because I had no confectioner’s sugar and fried in peanut oil and they turned out fantastic! Close to a donut shops fritters! I recommend this recipe! Sounds perfect, Hattie! So glad you enjoyed these :) Thanks! Hello Jennifer I have a question , I want to try your recipe next week but I wonder if I could make The dough in a bread machine instead of doing it handmade. It would be easier for us so if you can give us your advice if it can be done that way. Thank you ! Hi! I don’t have any experience with bread machines, but from what I understand, they really just do the kneading/rising part for you, so if that’s the case, I don’t see any reason why it wouldn’t work. The glaze calls for 1/4 tsp of alt? Is this suppose to be salt? WOW! Just made these, they are SO good. Absolutely perfect recipe. I like your glaze too, never made it like that before. BY THE WAY – if you take out the egg (and don’t use lard) , these are completely vegan. Please advertise them as vegan. Vegans will love you for it. 10 stars! Hi Jennifer! I’m from Washington State and also eat these at Top Pot so I’m shaking with excitement to make these! I now live in England do it will be a taste of home for me!! So you said I could use vegetable oil instead of shortening-same measurement? Hi Juanita and yes, just use the same amount of vegetable oil. Enjoy! Can these be baked in the oven? 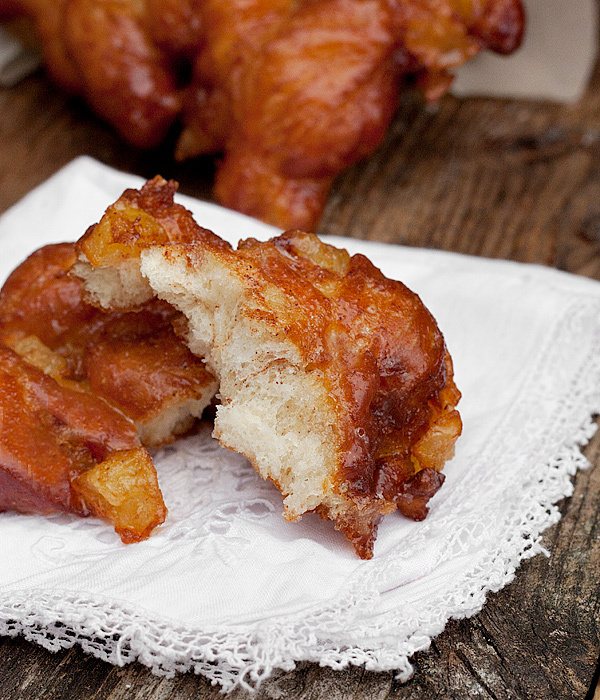 ,I try not to fry anything,that’s why I own a air-fryer.but Love apple fritters and such . 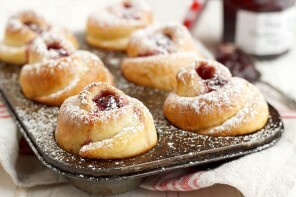 Hi Jacquie, While you can technically bake these, they would turn out like buns, rather than doughnuts. It’s the frying part that makes it a fritter doughnut. I do hear you. Frying is a pain :) I own an air fryer too, but when it comes to doughnuts, there’s really no substitute for frying in oil. I don’t understand 2 inch medium apples. is that supposed to be a measurement or just two apples? Hi Becky! Sorry, there was a stray “inch” in there. I have fixed it now so yes, it it just two apples. Thanks! They cooked a lot faster than I was expecting – so I overcooked the first two :( – so sad (but I used a dutch oven with oil and was having trouble keeping the temperature stable, so that may have been the reason why) I cooked the rest for about 1 minute per side, which ended up being perfect. So delicious!!!! So glad to hear, Patricia :) And yes, it’s tough to maintain temperature in a Dutch oven, for sure. Thanks! hello jennifer, are you able to substitute butter instead of lard? Hi Owen, Sorry for the late reply. I was away for a couple of days. Yes, I think you could easily use butter. Or even vegetable oil in place of the lard. Great recipe. Have made these & this recipe goes into my ‘Tried & Keeper’ file. Thanks for sharing from a fellow Ontarian in Kawartha Lakes area. Hi Marn and so glad you enjoyed these :) We’re practically neighbours (in Canada terms), which means you are getting this nasty weather, too. Oh well, good for baking! If I use all-purpose flour instead of bread flour, do I use the same exact amount? Also, I am allergic to lemons. What can I use instead? Hi Khansi. Yes you would use the same amount of flour. As for the lemon it is just to reduce browning of apples. You can omit. I’m making these as we speak, followed the recipe to a t. But it seems that my dough isn’t rising! And I know my yeast isn’t dead! Hi Stevie, How did it work out for you. Can’t think of any reason why your dough wouldn’t rise if your yeast proved. can i use all purpose flour instead of bread flour?bread flour isnt available at me place . Great recipe, I didn’t have corn syrup, so I used boiled cider for the glaze. Can’t wait to maybe try this recipe with roasted pumpkin! Thanks! these look delicious and I’m going to try them.. not sure if we can eat them all at once.. you mentioned freezing – should I freeze the already fried donuts or just the dough? If it’s the already fried donuts, how do you reheat it? in the microwave or do you pop them back to the deep fryer? Hi Alica, They freeze beautifully after being cooked. I re-heat with 10-15 seconds in the microwave. First rise overnight in fridge worked fine; overall, really delicious and very close to what I was looking for. Next time, I will, first – make more! and second – try making each one larger, maybe cut in 8 instead of 12. I also want more uneven pieces (craggier finished fritter), so will need to figure out how to get that. That’s great to know. Thanks! I know what you mean about larger. I had one in Seattle once that was the size of a dinner plate! I only have a small deep fryer though, so I’m not sure a big one would fit ;) Let me know how you make out with the craggier finish. Question – have you tried doing the first rise overnight? I want these for Sunday morning family breakfast and wont have time for both rises in the am (plus my kitchen on the chilly side). Thanks – cant wait to try them! Hi Stephanie, No I haven’t, but I don’t see why it wouldn’t work just fine. If you try, let me know how it worked. You’re killing me with these! Ughhh I need one. And I agree that a real doughnut is fried! Thanks Sarah. I need one (again) every time I look at this picture. 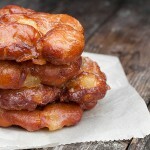 Hi Jennifer, so glad I came across your website and recipe for apple fritters. I’ve been wanting to make them, and was amazed when I learned you have and used the recipe out of the same donut cookbook I own as well – Top Pot’s! Will definitely be giving it a try this weekend! Hi Deanna. 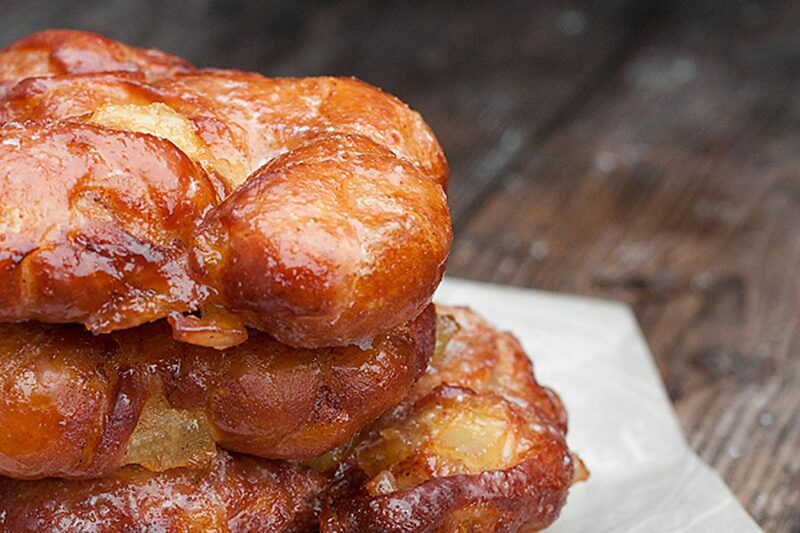 When I sought out recipes, I found precious few for the kind of apple fritter I had in mind. I thought my best bet was to try one from a donut place and I was disappointed. They were delicious! Jennifer, you are right on about this recipe, they turned out melt-in-your-mouth delicious. 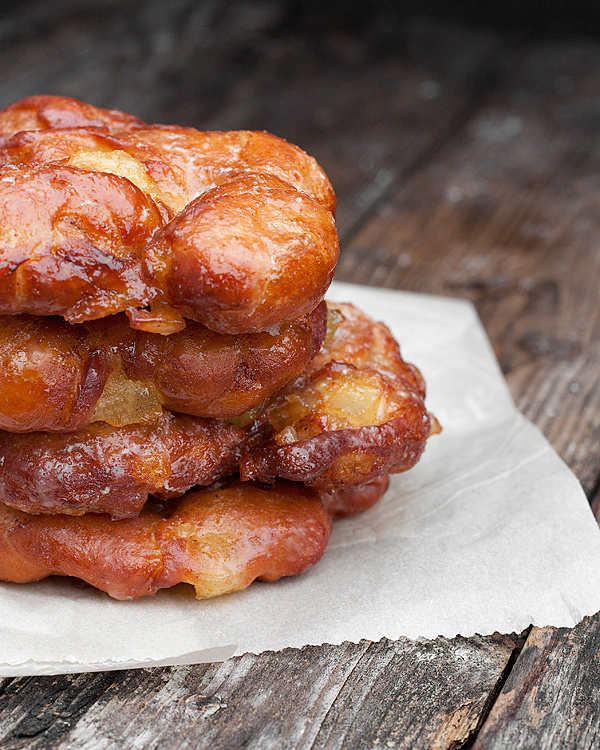 It’s great to finally have such a superb recipe for apple fritters! So glad you enjoyed them, Deanna! Just wondering if it is baking powder or baking soda in the recipe it has powder at the top and soda in the recipe instructions. Thanks!!! Hi Nessa, It’s baking powder, as per the ingredients. Sorry about that. I’ve fixed it in the instructions. Thanks for the heads ups! Thanks!!! The best Fritters. Excellent recipe. Will be making as a family favorite. You should, Sophie. Except for the extra step of deep frying, not any more complicated that any yeast baking. Jennifer – you’ve out done yourself again. I wish we were neighbours! These look so darn delicious. I remember standing in long line ups for apple fritters freshly made at our local farmers market. There is nothing like a fresh, warm apple fritter, for sure! Your fritters look scrumptious, I can almost smell them! Thanks Laura. I’m still nibbling on them today.